Visiting for the day, why not stay a while. A number of regular evening entertainment options are available. If you happen to live in the Village, these nightspots are right on your doorstep. Austin's Saloon & Eatery, 481 Peterson Rd, (847) 549-1972: Featuring live music, including nationally renowned bands Friday and Saturday evenings in the Fuel Room. Firkin, 1762 N Milwaukee Av, (847) 367-6168: Featuring live music Tuesday and Thursday evenings. Improv Playhouse, 735 N Milwaukee Av, (847) 968-4529: Improv comedy every other Friday and every Saturday night at the Black Box Space. Main Street Social, 608 N Milwaukee Ave, (847) 549-3490: Featuring live music select evening and brunch dates. Mickey Finn's Brewery, 345 N Milwaukee Av, (847) 362-6688: Featuring live music Thursday-Saturday evenings. 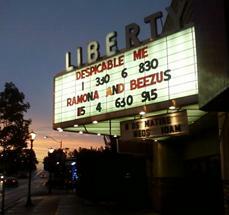 Liberty Theater, 708 N Milwaukee Av, (847) 362-3011: Newly released movies featured daily. Libertyville High School, 708 W Park Av, (847) 327-7000: Sporting events and fine arts programming are regularly available. The following are other evening programs which are occasionally available. Various community events are also available throughout the year, visit the Community Calendar for more information.